Leah Beeferman, independent artist and graphic designer for Cabinet Magazine, has produced her own map of Brooklyn’s Gowanus Canal: a mix of “history, fact & fantasy.” Combining cartography, myth, speculation, and history, the map can be downloaded from her website and printed out for your own navigational needs. [Image: A close-up of the map: “Next to the water around 5th Street is one of the two remaining active industries on the canal. From the subway, look for gravel moving on conveyor belts as it is mixed to make concrete”]. 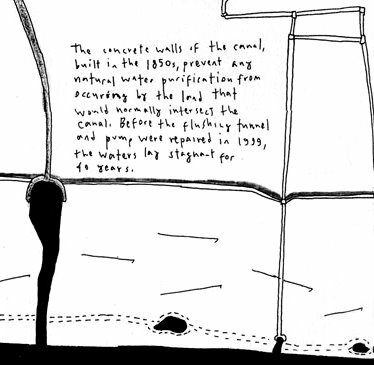 [Image: A close-up of the map: “The concrete walls of the canal, built in the 1850s, prevent any natural water purification from occurring by the land that would normally intersect the canal. Before the flushing tunnel and pump were repaired in 1999, the waters lay stagnant for 40 years”]. [Image: Gowanus Canal; New York Times. “The streets alongside it are practically deserted, the silence broken by the rumble of concrete mixers and oil tankers or the screech of buzz saws”]. In fact, the area is now gentrifying, with residential lofts and even a new Whole Foods moving in. The local argument, predictably, is whether upscale development or post-industrial dereliction is best. Returning to cartography, however, I was at a talk the other night by Henry Wendt, head of Quivira Vineyards and now something of a full-time map aficionado. [Image: William Faden, Chart of the N.W. Coast of America and the N.E. Coast of Asia, Explored in the Years 1778 and 1779 (London 1784, 1794)]. One of the maps in his collection, now on display at the University of Pennsylvania’s Arthur Ross Gallery, is this coastal chart, pictured above, by William Faden. Faden (and I might get this wrong, so forgive me) was Captain Cook’s onboard cartographer; this chart documents Cook’s journeys round the northern Pacific, including the coastline of what is now British Columbia. The reason I’m including it, however, is that if you go to the Arthur Ross Gallery in person and look closely at the map, you’ll see it’s full of weird little notes, a kind of on-going travelogue: “made canoes here,” “the Spaniards saw volcanoes here in 1755,” “an island of ice was seen here by Charles” – etc. 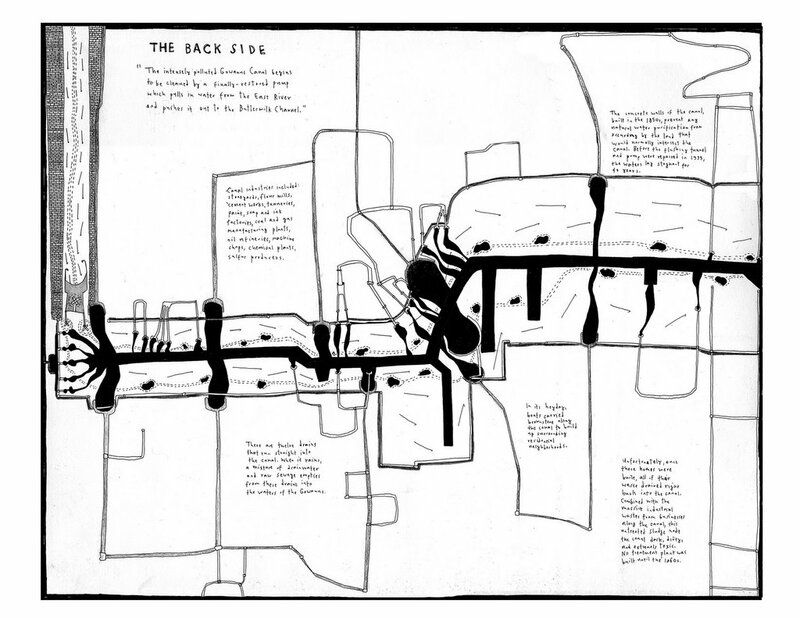 It’s somewhere between text and map, in other words, “history, fact & fantasy.” Narrative cartography. 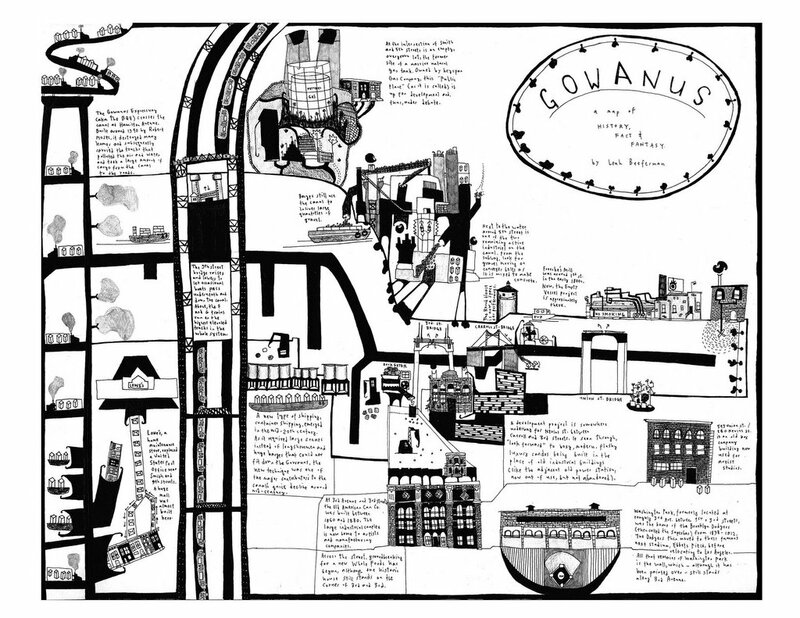 It’s Leah Beeferman’s map of Gowanus, on the scale of an entire coastline. Folk-maps of the Thames would be an interesting follow-up. Any info out there? 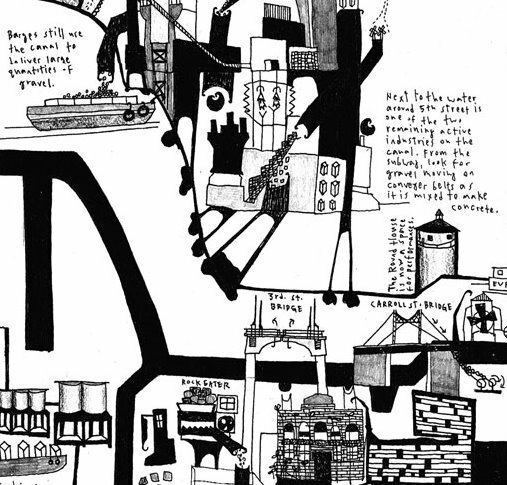 Ms. Beeferman probably knows about Mojdeh Baratloo’s “map” of the Gowanus published in 1991 in a lovely little book with the wonderful title “Angst: Cartography”. Very much an intuitive mapping process.